Freed from two decades of playing the parental role for her free-spirited mother, Sunny Goodwin, a horticulturist for the U. S. Botanic Garden in Washington, D. C., is celebrating her freedom despite her very real grief for her mother. Sunny was brought up by her mother who after Sunny’s birth left the Virginia commune where she had lived for nearly twenty years to rear her daughter in a row house in Old Alexandria deeded to her by Doyle Bartholomew Hartwell. Eight months after her mother’s death, Sunny discovers that Hartwell was her father and that he has left her part ownership in an old silk mill located in Blue Hollow Falls, a Virginia mountain town that is a world away from Sunny’s urban life. Her inheritance also includes Bailey Sutton, a ten-year-old half-sister who is an old soul; Addison Pearl “Addie” Whitaker, a stepmother who insists Sunny is family; and Sawyer Hartwell, a handsome veteran who Sunny suspects may be her half-brother. Sunny never plans for Blue Hollow Falls and the people there to become a significant part of her life. She does feel a connection to Bailey, but the feelings Sawyer evokes are not at all fraternal. Sunny is eager to return to her own world, but Addie has claimed Sunny as part of her makeshift family, and Sunny finds the pull of family hard to resist. Blue Hollow Falls and its residents offer Sunny peace and a sense of belonging that she needs, and Sawyer’s plans for the old silk mill offer their own fascination. When Sawyer proves to be her father’s adopted son and no blood relation, the pull grows even stronger. Can she reconcile her two worlds, or will she be forced to choose one and reject the other? 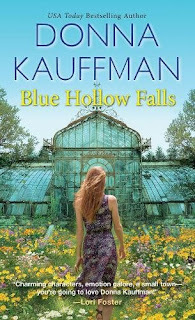 Kauffman excels at creating a powerful sense of place through geographical and historical details of Blue Hollow Falls. Sunny and Sawyer are likable characters who deserve happiness and readers will find it easy to root for their HEA. I especially appreciated that Sunny’s work as a horticulturist and Sawyer’s vision for transforming the old mill are essential parts of the story rather than mere throwaway references to their jobs. Earth mother Addie and young Bailey are also well-developed characters who add to the story’s emotional appeal. Seth Brogan, Sawyer’s war buddy and fellow Blue Hollow citizen, is a charming flirt with hidden layers, and he clearly merits his own story, as does the mysterious Will McCall. Blue Hollow Falls is a promising introduction to this series. I thoroughly enjoyed this book and look forward to more stories set in this Virginia town. If you like contemporary romance rooted in community and connection in the vein of RaeAnne Thayne and Sherryl Woods, I recommend that you add this book to your TBR stack. The charms of the Blue Ridge Mountains claim the heart of another heroine in the next in the series, a Christmas novella, The Inn at Blue Hollow Falls, an October 31 release that I have added to my must-read list. I have missed out on so much being sick. I will have to add her new series to my TBR pile. I also thought this was a wonderful book and thoroughly enjoyed reading it.